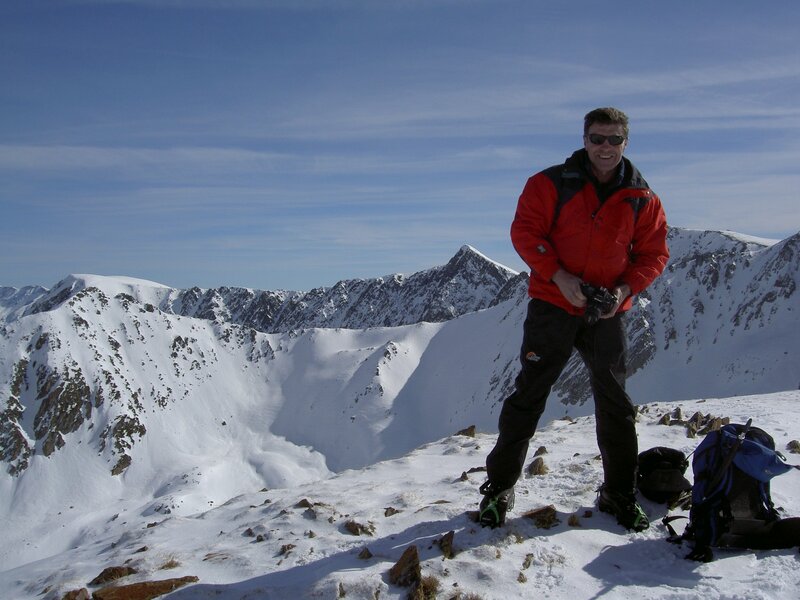 The cold weather continued into February giving great days on the fells. 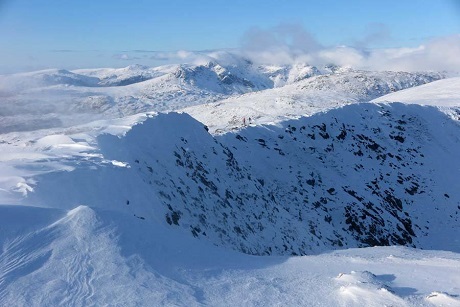 Here is one from Norman on Coniston Old Man, looking to the Scafell range. 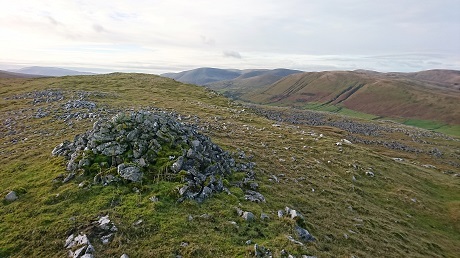 With strong winds and damp weather forecast on the tops, and wet weather occurring at the start, Kevin made the wise decision to go for his low level option and leave Wild Boar Fell for another day. 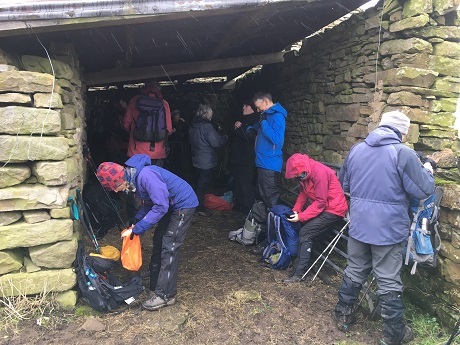 After Roger had realised that he'd forgotten his boots and had to walk in his trainers, and Maya had forgotten her waterproof jacket and had to borrow a spare one, the thirteen members set off from the Fat Lamb Inn just outside Ravenstonedale. Heading west through muddy fields, the group soon hit a minor road at Arthegarth and headed south west over the shoulder of Harter Fell. Just short of Adamthwaite, the route veered off onto a bridleway which led through Sprintgill to the A683. Crossing this, Kevin led up to Dovengill and the minor tarmac road that headed north. This was soon left to ascend onto the curiously named Fell End Clouds (so called because of the limestone rocks scattered about? ), where lime kilns and mining activity was seen. The various channels in the vicinity were created by extracting minerals, mainly lead, from the exposed veins. The delightful walk continued along the ridge over Stennerskeugh Clouds before dropping down onto the old bridleway and into Stennerskeugh itself. A slight diversion was made to see the Folly in Hwith House grounds - see below. The Fat Lamb was soon reached, and a drink inside rounded off what turned out to be an interesting walk despite the weather. Thank you Kevin. Due to the poor weather, not many photos were taken, so two of the photos below were taken from the internet. Norman adds - The name Stennerskeugh is odd. In 1770 it was written Stenhouseskers. 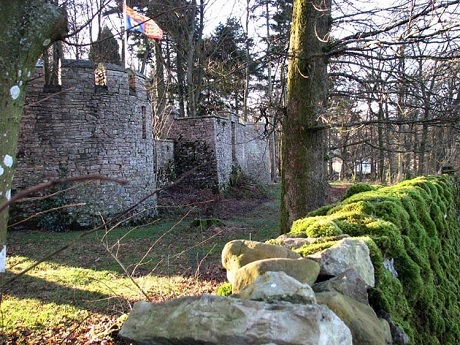 Stenhouse could be ' stone house', and skews or sceugh means 'woodlands'. ....possibly. At the start, from left to right: Maya with Bob, Ruth, David, Kevin, Les, Frank, Mick, Clare, Jan, Norman, Roger, and Jenny, with Hugh taking the photo. Lunch was taken in a shelter near Dovengill. Make your own seat from the gate, or bring in stones from outside. At least it was a good shelter from the rain. 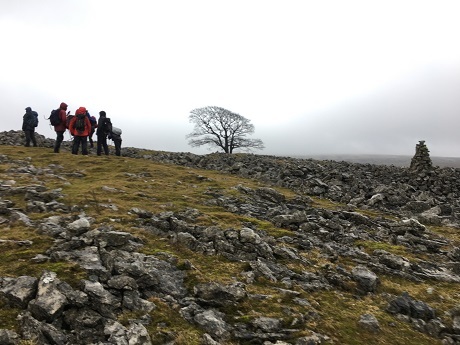 The group examining the mine workings on the Fell End Clouds , with the 'conspicuous' tree in the centre. Looking back along the limestone ridge, with Harter Fell behind and to the right. The Folly - This is a remnant of Hwith House that was demolished in 1927. It was a fine house built in 1868 by John Hewetson, who gave it its strange name composed of the initials of the first names of his five sons. 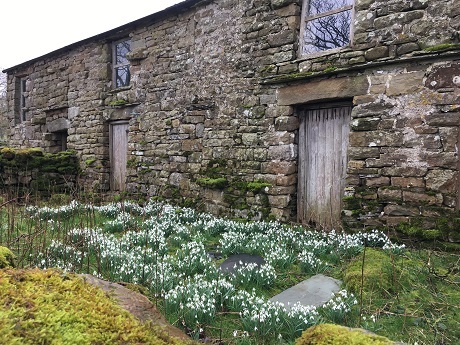 A lovely display of Snowdrops in Stennerskeugh outside a deserted house. Krysia always manages to find interesting walks to give members an appetite for the annual dinner that evening, but this one was exceptional by any standard, including the weather. On a beautiful warm morning more typical of May, Krysia led from the cars parked at the Strickland Arms up and over Sizergn Fell to join the Levens-Brigsteer Road. After passing the reservoir, the route branched off into Brigsteer Woods with the daffodils not quite open yet. 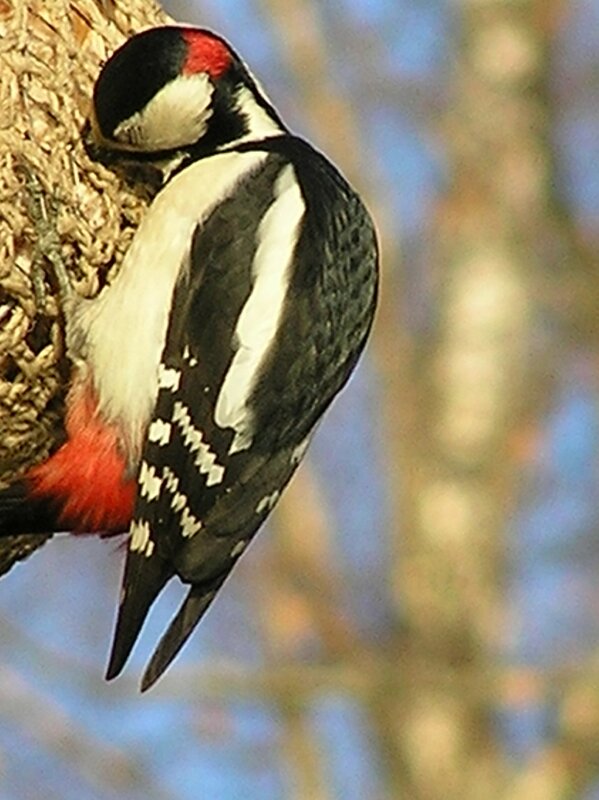 The objective was the hide at Park End Moss, created by the NT in 2014. A selection of birds were seen including teal, moorhen, little grebe, lapwing, little egret, greylag geese, but no marsh harrier unfortunately. The route back led along the road nearly to Brigsteer, then up to Helsington Church where lunch was taken. The final leg took in Holeslack Farm and an amazing yew tree, before passing Sizergh cafe and the throng of visitors. Thanks Krysia for a lovely walk. Start of the walk at the Strickland Arms. The view of the reserve from the hide. The beautiful old yew tree. 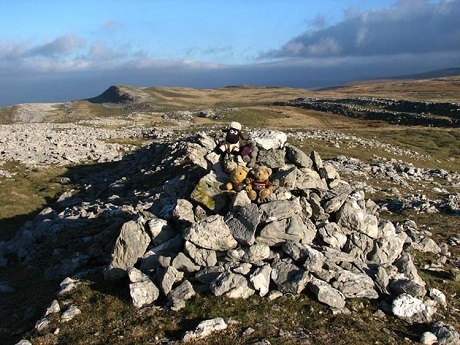 Congratulations to Mick Fox on completing all of the walks in Wainwright's book 'Walks in Limestone Country' (having completed all the walks in Wainwrights 'Walks on the Howgill Fells' the week before. 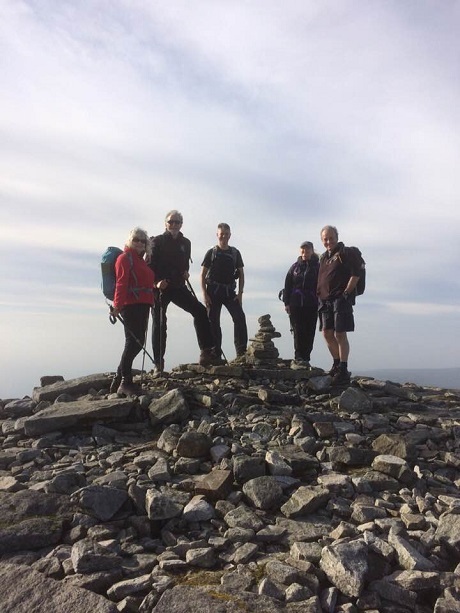 Here he is on the right on Ingleborough summit, with Clare, Hugh, Kevin, Tina, with Angie taking the photo. 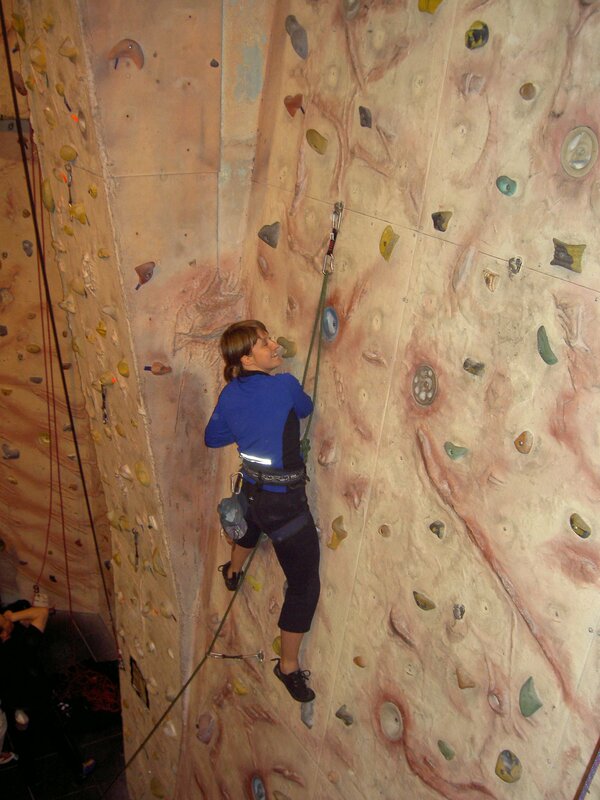 A decent turn out for this 'have a go' evening at the Kendal Climbing Wall on a drizzly evening. Back to normal after that lovely mild weather. Most will be meeting again each Thursday evening. Val leading a route to set the rope, with Kevin belaying, and Mick giving Norman some advice. Meanwhile, Colin is showing Harry how to tie on.